Barack Obama stole his campaign slogan “Yes we can!” from the farm workers’ union that took root in California in the 1960s. And by “stole,” I mean he openly noted that the slogan had been coined (In Spanish: ¡Sí se puede!) by legendary labor rights agitator Cesar Chavez. Then he had to apologize to Dolores Huerta, because while the acknowledged face of the farm workers’ movement was Chavez, it was co-founder Huerta who’d come up with the saying. Peter Bratt’s vibrant, archivally rich film is a little scattered, and it’s big on feeling and in spots a little light on fact—ideally, a program designed to educate the public about a figure who is understudied and was controversial in her day would have an abundance of both. But it offers a fascinating look at what we now call intersectionality. Huerta spoke for the farm workers. She spoke for Mexicans and Mexican-Americans. She spoke for all non-white people. For all people. She spoke for women. For feminists. She spoke for the poor, the illiterate, the underserved. Not always all of those at once and not necessarily in that order, and in part it depended on whom you asked. Certainly, though she was a powerful, independent, unconventional woman, “feminism” per se was not her primary platform, especially not in her early years (a trip to New York where she intersected with Gloria Steinem seems to have been very transformative for both women). She was concerned with the plight of poor people being bullied, disenfranchised and held back by wealthy growers who could perpetrate whatever abuse or neglect happened to suit them. Many of those people were immigrants from Mexico (and still are), but while Huerta was clearly proud of her Latina heritage she was quick to see people of other ethnicities who worked for agri-business as being equally in need of a champion. And in service to that idea she took a Ghandi-esque stance. She chose poverty (her eleven kids seem somewhat mixed on how that worked for them). She sacrificed her time, her energy, and her safety (she was jailed and, in one instance, beaten with a police baton badly enough to be bedridden for months). She even risked the trust and security of her family (a fact which Huerta now says pains her to recall, but one doesn’t get the sense she’d do it differently if given the chance). Posterity gave her a backseat to Chavez in the public eye, but she was very much his equal and cohort; the film’s implication is that most people tended to deify Chavez, but Huerta stood up to him, and that’s why they worked so well together. 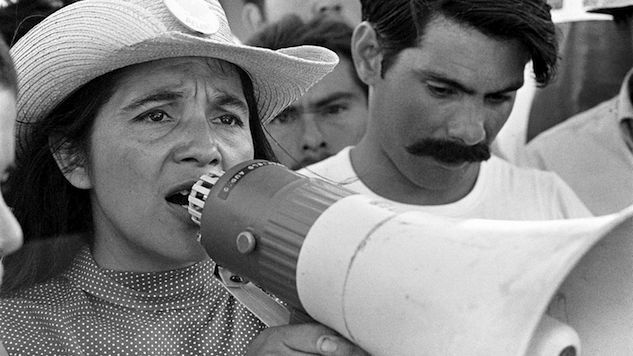 The footage careens a bit, but I’m not sure it’s a significant disadvantage: Dolores Huerta was and remains a multifaceted, highly dynamic woman and complicated human mosaic. Capturing all the pieces at once isn’t easy. Perhaps that’s the reality of working with her as a documentary subject, and one on which it’d be wrong to try and impose too much linearity. Sometimes it really seems like we’re plain incapable of learning from our own history. The notion of a petite brown woman who generated a huge amount of voltage and showed others they too could be power sources should never be something to fear; it should only ever be inspirational, even to the wealthy and powerful who could supposedly be undermined or toppled by such a person. But these are sticky, sticky constructs for what I imagine are a few odious and morally bankrupt reasons and a hell of a lot of mindless change-fearing ones. Some people will watch this film and be angry that Huerta’s remarkable story has been ignored or suppressed or reduced. (Even within the union she helped to create, her role was often minimized.) I’m less angry than simply bewildered by how much we say we want to see change, or be change, and how hard we push back on the rare spirits who have the pure energy and will to effect it. Dolores Huerta was (and is) an extremely influential and interesting woman who changed the landscape of American agribusiness and deserves a prominent place in the pantheon of civil rights icons. This documentary’s not exactly perfect, but it’s thorough, sincere and real and a great primer if you’re one of the many to whom her name is unfamiliar. Dolores, from Independent Lens, airs tonight at 9 p.m. on PBS. Check your local listings.